Free download Exlade Cryptic Disk latest version. 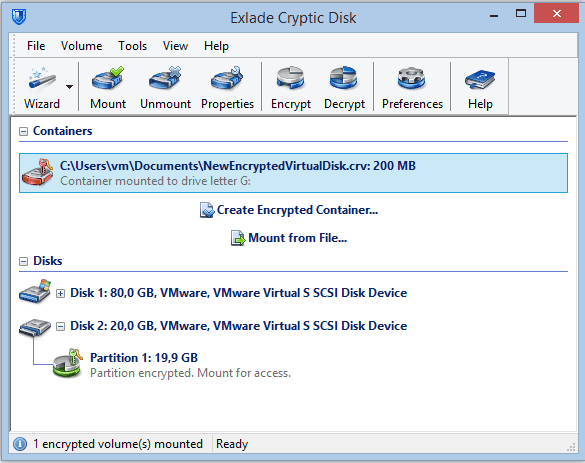 With Exlade Cryptic Disk, you can create not only a virtual encrypted disk but also can create physical HDDs, Pen Drives and Memory cards. Its Encrypted containers is a virtual volume stored in an encrypted file. To gain access to the encrypted data (i.e. mount) you need to enter the correct password. A container file can be moved, copied or deleted just like any other file. You can prevent access at any time. The container is also automatically locked upon system shutdown. Drive Encryption feature has amazing functionalities. Cryptic Disk encrypts drives to give robust protection against unauthorized access. ou need to provide the password or key file to gain access to the encrypted drive. You can prevent access at any time. The drive is automatically locked on system shutdown. After system boot or connection of an external encrypted drive, access to the drive is denied. Once the password has been entered, you can work with the drive like any other. Cryptic Disk supports several well-known encryption algorithms: AES (Rijndael), Serpent, Twofish, Blowfish, CAST6. Data encryption is performed in XTS mode (IEEE 1619 standards), specifically designed for drive encryption. Inside any encrypted container or drive you can create a hidden encrypted volume. It is impossible to prove that the hidden encrypted volume exists. A hidden volume is distributed over unused sectors of the encrypted drive on which it’s created. Unused sectors are the slices not used by the file system. Cryptic Disk has a mechanism for remembering and restoring public access settings for shared files and folders. Upon mounting an encrypted drive, the software automatically restores public access to shared resources. Public access settings are stored in the headers of an encrypted drive and are protected as securely as all the data. There are also many more features that you can know from the Author’s Website.